Cilantro, also known as coriander, grows wild over a large area, making it difficult to determine where it originated. Seeds have been found in Egyptian tombs. The manna eaten by the children of Israel in the wilderness was supposedly cilantro seed. It is still one of the bitter herbs used in the Passover by the Jewish people. It was one of the first seeds brought over to the Americas by the early settlers in 1670. Now it is widely used as a seasoning in many dishes. It is very popular to add flavor in Mexican cuisine. Before you plant, mix in 1 inch (2.5 cm) of good organic compost. It is not recommended that seeds be started indoors. 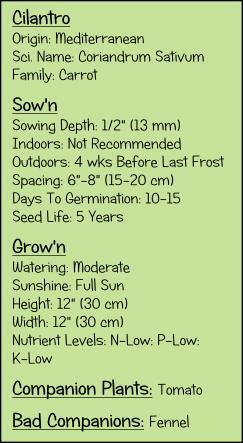 It tends to bolt if transplanted, so it is recommended to sow outdoors after danger of frost. Sow seed in rows and thin to 6 to 8 inches (15 to 20 cm) apart. Make successive plantings every 2-3 weeks from spring until summer for a continuous supply. Keep soil evenly moist and don’t allow it to get too dry, as this will also cause the plant to bolt. Spread 3 inches (7 cm) mulch around the plants to keep the soil evenly moist. No need to fertilize unless the plant shows signs of nutrient deficiency. If you do fertilize, fertilize only lightly. 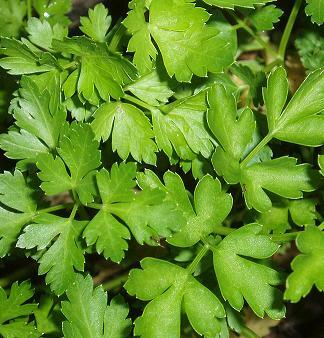 Cilantro leaves can be harvested as they grow. Only harvest the leaves that you need at the time. Be sure to harvest the whole plant though, before it starts to go to seed, which is about 8” (20 cm) tall. Use quickly, within a few days, because cilantro does not store well. If you are growing the cilantro for coriander seed, leave the plant until fall, where it will produce the seeds. Snip the whole seed head off when it turns a yellowish brown, and then hang upside down in a paper bag in a warm, dry place. In a week or two, the seeds will drop to the bottom of the bag where they can be gathered and stored in a glass jar.